This textile study sample was woven by Lydia van Gelder in preparation for a larger wall hanging, “Houses on a Street” that she created for the 1939 Golden Gate International Exposition in San Francisco. Serving as a diminutive sample for the larger piece, it is tapestry woven – double interlocked with extended dovetailing for shading. In this work, Van Gelder makes a departure from the fine, smooth yarns utilized during this period and instead inventively employs already pre-dyed mop yarns from the California Cotton Mills in Oakland. Today, Van Gelder is regarded as an important influence in the California fiber movements of the 1960s and 70s, but this piece from 1939 demonstrates a nascent interest in the modernist aesthetic and an adroit understanding of the textile medium. Van Gelder later collaborated with Alfred Bühler of Switzerland, to write the influential instructional books, “Ikat” (1980) and “Ikat II” (1996). 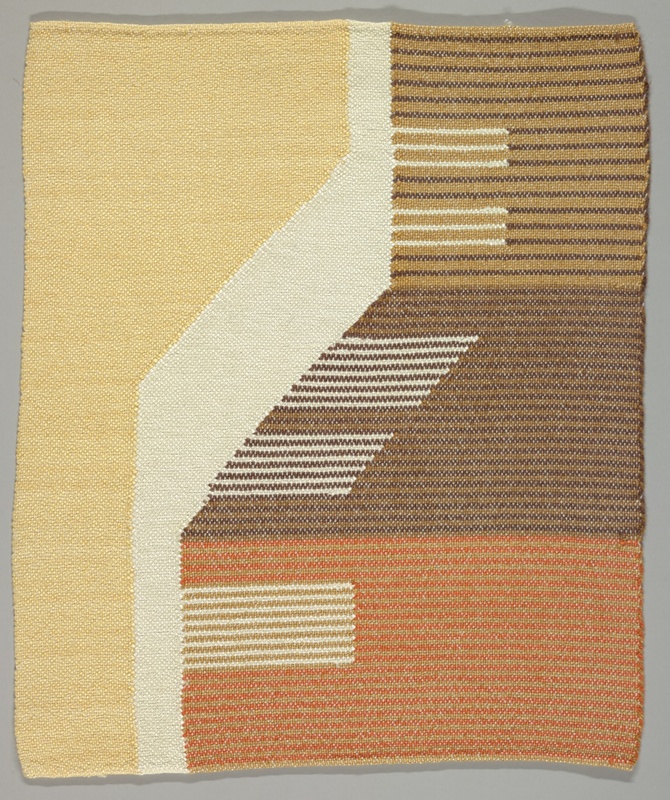 Study sample for "Houses on a Street," 1939, USA, made by Lydia Van Gelder (American, 1911–2012), tapestry woven cotton (double interlocked with extended dovetailing for shading), Gift of Lydia Van Gelder, 1996-47-2.